A blog about good drinks, mostly alcoholic, and the events that occur. In my youth, the big thing was all the flavored Absolut Vodkas. Please wore shirts, did shots, and saved bottles. I am usually an on-the-rocks guy, so the flavor was often too bold, and many of the flavors tasted fake to me. A few years back Jack Daniels came out with the Honey version- I was not a fan. However, about 2 years ago I bumped into Crown Royal's Maple Finished and I must say I like it. Now, this is not something I could drink all night long, it has a strong aroma and sweet finish that does not allow heavy drinking, but this is a flavored spirit that soul. There are cocktails that can be made, however this is such a pleasing drink neat. 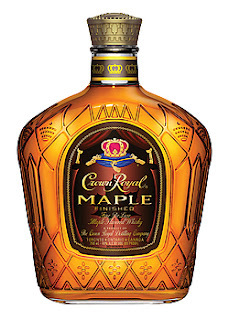 It pours thin, like any other whiskey, but you are almost immediately hit by that subtle nostalgic aroma of maple syrup. At 80 proof, visually you see little difference from its unflavored counterpart- but a little aeration in the glass and and a nasal draw hits you with a beautiful smell of maple syrup and rich caramel. The taste is warm and pleasing. There is a hint or sweetness, but not too sweet... surprisingly low body for the aroma, but perhaps a little more than the normal Crown. The sweet aromatic spirit goes down smooth and finishes with just a little bite.